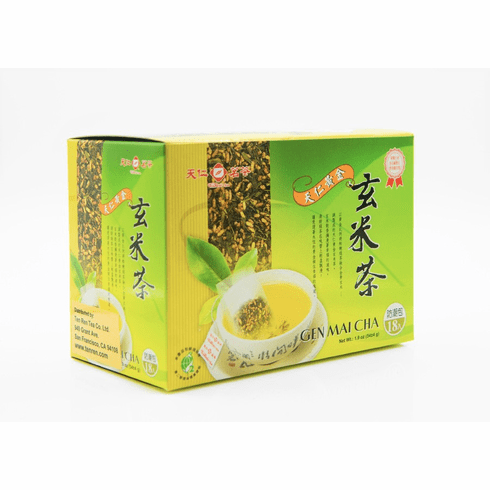 Ten Ren's Genmaicha Green Tea bags consists of Sencha Green Tea blended with brown rice. Tea steeped from these tea leaves has a light yellow hue. The taste is pleasant with a hint of roasted rice and a mild aftertaste. The aroma is a light scent of freshness and roasted rice. Whole-Leaf tea bags are manufactured with a special new machine that allows the whole tea leaf, as found in our loose tea products, to be placed into a tea bag instead of having to cut the tea leaves into a smaller size. Some tea connoisseurs believe that whole tea leaves are one of the best ways to enjoy tea. This tea is available in boxes of 18. The water used to steep this tea should be about 160-180�F or 70-80�C. Use one tea bag for about every 6 ounces (150 ml) of water. A steeping time of about 2 minutes is recommended with more or less time depending on the desired concentration. As a rough guide, the higher the temperature of the water or the greater the amount of leaves used, the shorter the steeping time should be. Dimensional shipping weight is 0.72 lb.